One of the best sections anywhere on the lower Black River, this trip features miles of lush sandy beaches (perfect for picnics or overnight campouts), a sense of sheer wilderness and being away from it all, stunningly tall sand bluffs, three exposed rock outcrop walls, one side canyon, and one waterfall for the intrepid paddler to explore. We recommend this level. But this section of the river should always have enough water to paddle. Time: Put in at 10:15a. Out at 1:00p. Wildlife: Great blue herons, deer, crows, bald eagles, turtles, hawks and a blue-winged teal. Anyway, the last time we were out this way was about three years ago for what was an overnight expedition beginning in Black River Falls. Our intention was to go all the way down to North Bend, but the current was slow and so was our pace. In the end, rather than push it – especially with two twelve-year-olds at the time – we settled on taking out at Melrose, the next take-out option before North Bend. As a result, coming back to “complete” things, by putting-in at Melrose and taking-out at North Bend, has been on my bucket list since 2013. It’s less an OCD thing than wanting to compare such a trip now with my initial experience in 2010. On the downstream side of the sandbar island I was privy to something I’ve never been so lucky to witness before: two deer that swam from the island to the opposite bank directly before me, no more than 35 yards away. It truly was breathtaking. At first, I assumed they were taking a drink; but then they kept walking into the water until fully submerged, only their heads above the water line, as they bobbed forward slowly but surely to the other side. It really was an incredible experience to behold. Then, just after that, you’ll come upon a long graceful sweep of a stunningly tall sand cliff on the right, at least 60 feet high. Such cliffs are frequent along the lower Black River – particularly in the sections downstream from this trip, i.e., from North Bend to Highway 53 and also from Highway 53 to Highway 35. Such sandy cliffs are common too on the Eau Claire, Chippewa, and Red Cedar Rivers, and they’re always a real delight. The sheer size of them positively dwarfs the puny paddler. Shortly after the sand cliff, after a couple football field-sized sandbars, you’ll see the first of three total rock outcrop sections on this trip, all of them on river-right. They’re more rock walls than cliffs or bluffs, somehwat modest, but still quite attractive and a fun novelty to sidle up to. If you look for it, you’ll see a small recess in the rock wall and a tiny trickle of a stream that leads into a small side canyon. Paddling up this stream is not easy because there’s an incredible cluster of downed trees – so many in such a concentration that it appears to be intentional, not coincidental; that someone constructed such barriers to prevent paddlers from exploring the mini canyon. (At the top of the bank on the left side is a cabin that overlooks the mini canyon. And this section of the lower Black River is very popular. Just saying…) Anyway, it’s worth the inconvenience because at the end of the stream is an oval-shaped sandstone gorge at the top of which is a lip where the stream pours over and falls into a pool below. The fall was little more than a drippy trickle on this day, since it hadn’t rained in weeks. But one can imagine a much more magical effect after a recent rain! Bear in mind that the above-mentioned – the wave-lined sandbar island, the sandy cliff, the exposed rock outcrops, and the side canyon, all of these are in the first 1-2 miles. It’s a heckuva beginning to a trip. After the side canyon the landscape relaxes a little and feels pretty modest for a few miles. It’s a little monotonous, but it’s never ugly or truly boring. Either way, the sense of isolation is palpable, as there’s hardly any sight or sound of development anywhere. Virtually this entire trip lies along public land on the river-left, contiguous parcels of state natural areas that feature floodplains and bottomlands. The first of these is called the Black River Savanna SNA, the other the North Bend Bottoms Wildlife Area (which in turn encloses the North Bend Wet Prairie SNA). In theory, an intrepid paddler could explore these backwaters, any number of which have tributary streams, sloughs, and side channels. Whether you wish to do so, or can (in terms of down trees), is up to your druthers and how much time you have to be on the water. The river will gently bend here and there in long, easy arcs, and you’ll come upon the second and eventually third rock outcrop sections. At the second, you’ll also see a shimmering vista of tall hills in the background. Like in many places in Jackson County, from far away these hills look like mini mountains. It’s one of many reasons that we so love this part of the state, where there’s an undeniable northcountry feel to it, even though it’s west-central Wisconsin and only two hours away from Madison. But wait, there’s one last huzzah! At the take-out in North Bend (which is behind a bar with a river-facing patio – a great place for a post-paddle beer and bite to eat, by the way) you’ll see yet another skimpy, shallow side stream on the right called Mill Creek. Turn into it and you’ll encounter a couple down trees and low-hanging branches to negotiate, but these are miniscule nuisances and well-worth the slight inconvenience. For only 25 yards later you’ll be at the bottom of a beautiful and totally random waterfall. It’s more of a ledge, about 8’ tall, but it’s surrounded by a mini-gorge of gloriously colored sandstone, the wettest of which feature ochre and green mineral streaks down the rock faces. This waterfall itself is below yet another waterfall just upstream of it, the latter created by a dam (but still quite striking). I mean, how often does one see a double waterfall? The views are a heckuva good way to wrap up what was already a very pretty trip! We here at Miles Paddled try to be as objective and equanimous as possible in order to provide the most impartial information to you, dear reader. Naturally, there will always be a bias since we’re just two guys, just two human beings. That disclaimer should be a given. But we do try to put our personal cravings or aversions aside, since those are relative. We know that something we uniquely love might be lost on another paddler, just as something (usually minor) we’d just as soon skip might be the bee’s knees for someone else. Again, this should be a given. So, when it comes to offering something we didn’t like on a specific trip, we strive to be as level-minded as possible. Indeed, sometimes there is that rare trip we are so fortunate to experience that is flawless and unblemished by any quibble or preference. But those are the five-star trips that are hard to come by. Not that we look to find faults or paddle with half-empty expectations; but by the same token we don’t want to come off as moon-eyed romantics who fall and fawn for every such river whim. Very few sections of very few rivers can be truly considered perfect, no matter how critical one is. With that in mind, the only matter to mention for this trip is what we’ve said before about the Black River: some segments of it can be a little monotonous and dull, notwithstanding the stunning punctuations along the way, be they side canyons, cliffs, tall sandbanks, waterfalls, rapids, rock outcrops, etc. It’s not like the Kickapoo River from Ontario to La Farge or the Bois Brule River, where the paddling experience is like going to the geological equivalent of Disney World and mile after mile shines with wonder after wonder. But such rivers or sections of rivers are exceedingly rare. 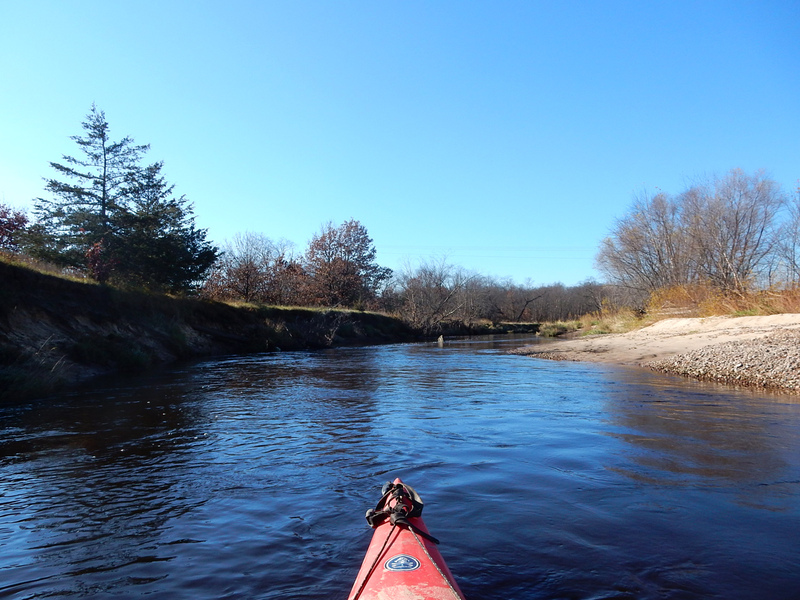 If the lower Black River could be “edited” in such a way as to feature 40 miles of nonstop knee-knocking splendor, then it too would be a flawless, five-star trip – a true, must-do sojourn anywhere in the Upper Midwest. But the relatively monotonous moments are very minor quibbles. They’re just something we feel obliged to mention in order to come off as down-to-earth and real insofar as what can be expected. We love this day trip and totally recommend it. In fact, just about any trip on the Black River is worth doing, the lower or upper sections (downstream from Black River Falls or upstream, respectively). It and its many incredible tributaries are why this part of Wisconsin is probably our favorite place to go paddling. Also, while any of the trips down the lower Black River are fully adaptable for kayaks, we feel that it’s more of a canoeing river, especially if doing an overnight expedition. Like the lower Wisconsin, the lower Black is broad and wide, resplendent in lush sandbars, with pretty much no obstacles or tight, twisty meanders. As such, it’s perfect for canoes. Some day (now cue the corny Sousa march music) we’d like to do the whole lower Black River from Black River Falls down to Trempealeau/Onalaska. Til then, any combination of sections will be sure to reward a paddler. 8.5 miles, almost all of which is along Highway 54. Totally adequate for bicycling, but not ideal. Several hills will humble even the best cyclist. Put-in at Melrose public boat launch (picture taken in 2013). Looking downstream once on the water. There’s a large island just downstream from the put-in. Striking textures from recently very high water events. Sometimes Nature is quite the sculptor. Two deer looking to quench their thirst? Nope. Just two deer going for a quick morning swim across the river. They’re not standing on the bottom, mind you. Gloriously tall sand bank on the right only half a mile from the put-in. Long bend to the left for a sand bank at least 60’ tall. Don’t you just love that classic autumn blue sky in Wisconsin? Fun reflections where the sun is still burning the morning fog. The first of three sections of exposed rock outcrops (all on the right). I must’ve missed the foliage peak by a couple weeks. Easy to miss entrance to small micro canyon at the first rock outcrops. Which is this! After recent rain, this would be a waterfall. What is it about the Black River Falls area that is so rich in these secret pockets of geology? Back on the water, it often looks like this: wide, relatively slow, but undeveloped and pretty. How often does one see this while paddling? It’s a testament to how popular this section of the Black River is, particularly amongst those renting boats. Fun little side channel diversion. One of several scenes indicating the flood-stage of the Black River only a month ago. Always sandy, you’ll want to watch out for random super-shallow sections. Coming upon the second section of exposed rock outcrops. Pretty modest, all things considered, but still always a treat to paddle past. The towering hills of Jackson County. I mean, c’mon! Is there any doubt why we love this part of the state so much? More crevice than cave, but still pretty cool. One can imagine such a stretch giving welcome relief from the sun on hot summer days. A classic example of being able to better see the landscape when the trees are leafless. We’re suckers for that combination of clear water, sandy soil, hills, and pine trees. Very woodsy and floodplains-featured at times, always on river-left. The third and final section of the exposed rocks outcrops. One of many tributary streams in the woodsy floodplains throughout this trip. Most paddlers go right, which is the main channel and most direct route to North Bend. One of so many gorgeous sandbars along this trip. After a slight bend to the left you’ll come upon the bar, where the take-out is located. … In order to see this beauty. I mean, seriously! This is just there, doing its own thing. And there are so many of these in random, inconspicuous places throughout Jackson County, almost all of which are on or near the Black River itself. Yes, that’s another waterfall upstream of this one (to be fair, the other one is human-made). The public boat launch behind the bar in North Bend. And here’s that other, unnatural waterfall, best seen from Highway 54 during the shuttle.